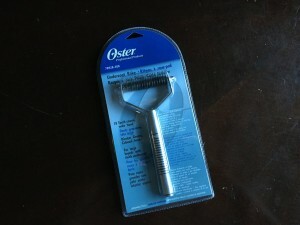 The Oster Undercoat Rake is an excellent grooming tool for Huskies. I’ve been using it for a few months now, and find it to deliver a smooth grooming experience, for my dog and myself. 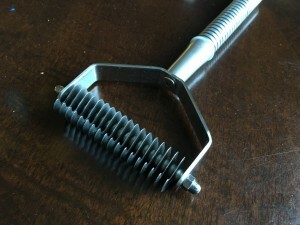 At first look, it almost looks like a torture device, its teeth look like blades, it’s all metallic, where did this thing come from a surgical tools catalog? But worry not, it’s actually a great tool to add to your Husky grooming arsenal. If you look closely its teeth aren’t the standard type of pinpoint conical tips that you’re probably used to. These almost look like blades the way they stick out. Thankfully, they are smooth and rounded at the edges so your Husky definitely won’t be hurt by this rake. In contrast, whenever I use the Furminator I always end pulling a few hairs, and I know my dog doesn’t find that pleasant because she winces every time. The way it works is that the teeth are distanced pretty generously so you won’t end up pulling any live hairs, just the dead ones in the undercoat, which is awesome. 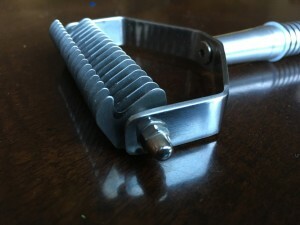 This is a professional grade dog grooming tool. It’s made of solid steel and you can feel it when you pick it up. It’s got that weightiness that you’d look for in a solid flashlight, and to be honest I was surprised by its quality. Since it is all metal, it has these inset rings along with a rubber ring that helps keep it from slipping out of your hand. If it isn’t obvious by this point, I love this tool. 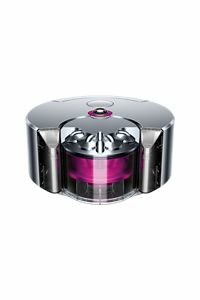 While it doesn’t offer the kind of convenience in hair removal that the Furminator would, with the push-button hair dispenser, it does make up for shortcomings I’ve found in the Furminator. As I’ve said earlier, I’ve been using this for a few months now and will be using it as my primary grooming tool from here on out.